January 15, 2014 /0 Comments/in Glass Gem Crafts, Valentine Crafts, Women's Ministry Crafts /by Craft Supplies for Less, Inc.
Valentine’s Day will be here before you know it. Whether you love this holiday or not, we are sure you’ll love this Heart Mirror! It’s a perfect Valentine’s Day gift for someone you love. 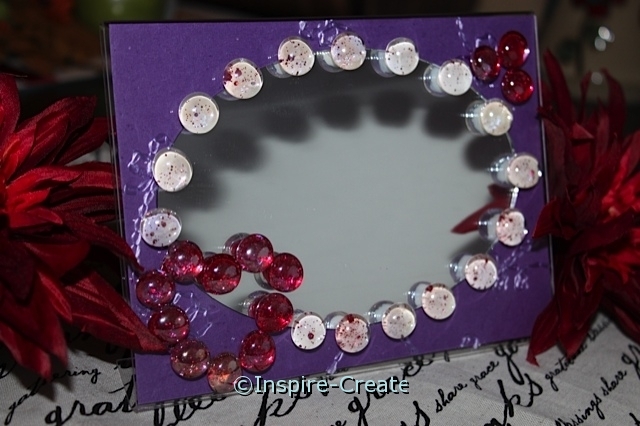 Best of all it’s inexpensive to create with a Bent Acrylic Frame, Oval Mirror, and a few Mini Glass Gems. Great Group Craft too! Gather a few friends together and enjoy a night of crafting. It’s sure to be as much fun to make as it will be to give away! Don’t you love crafts like this? We do! This Heart Mirror Craft is sure to inspire you… the creativity is endless! 1. 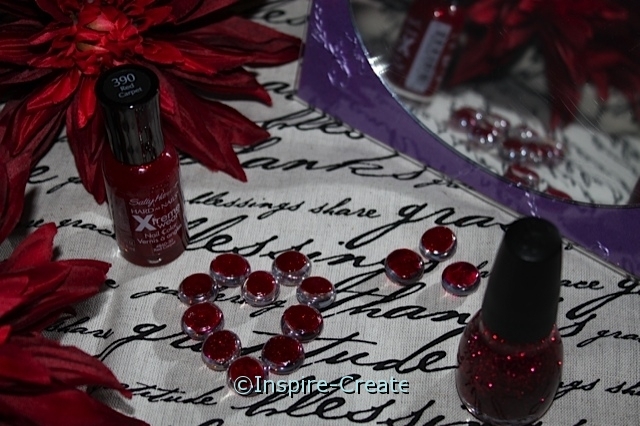 Begin by painting the backs of the Mini Glass Gems with a red glitter nail polish. Let dry and then paint over the glitter polish with one coat of Red Nail Polish. Paint all the gems and allow to dry (usually 20-30 minutes). Would you rather have a different color heart? Be Creative… paint the glass gems any color you would like! This is the best part of using Nail Polish to make the colored glass gems. The possibilities are endless. 2. While the nail polish dries on the glass gems, cut a 7×5″ piece of scrapbook paper to fit in the Bent Acrylic Frame. 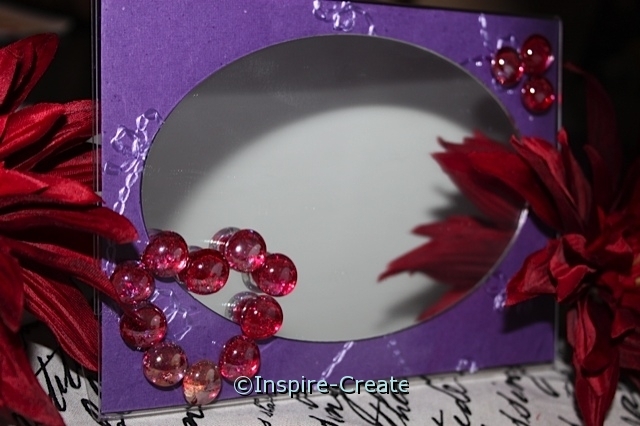 Attach a 4×6″ Oval Mirror to the center of the scrapbook paper with Glue Dots. 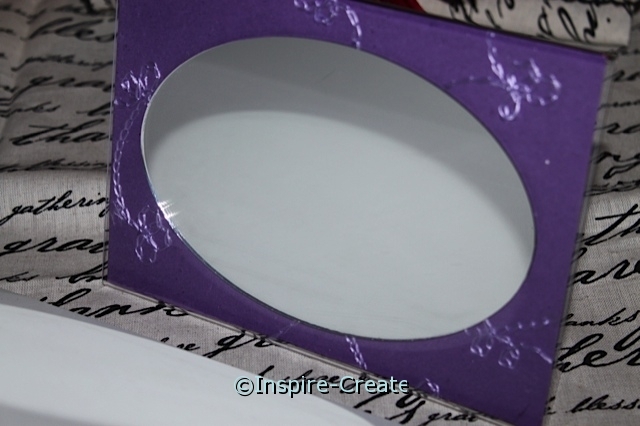 Then slide the oval mirror & paper into the Acrylic Frame. 3. Now it’s time to add the glass gems to the frame! This is best done by laying the frame down on a work surface and making it level with any item that is about 1 3/4″ tall. We used a glass lid, however, craft foam, a dishcloth or folded towel would work too. Once the gems are completely dry (about 20-30 minutes), attach each painted gem to a Mini Glue Dot and then apply 3) gems to the top right corner of the frame. 4. 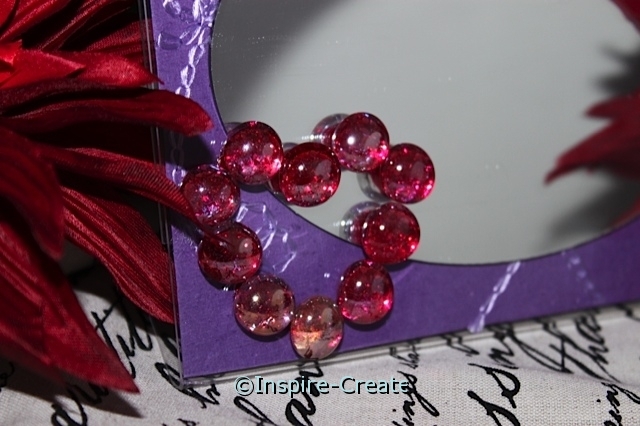 Next, make a “Heart” on the lower left corner of the frame with the painted Red Glass Gems. We used 10) Mini Glass Gems to make the heart. Tip: lay out the glass gems on the frame to create the heart design first. Once the heart is the way you would like, attach each gem with a Mini Glue Dot. 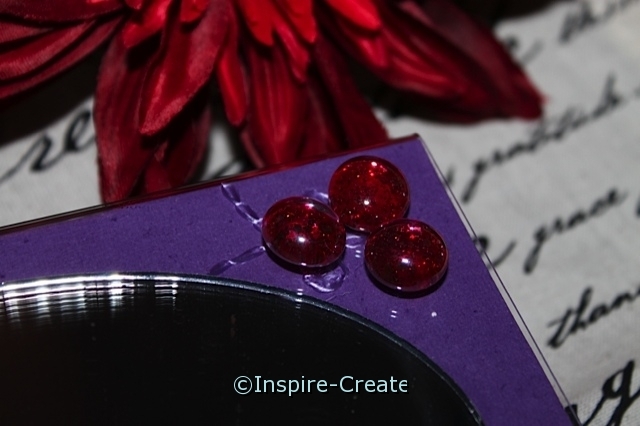 Optional: Paint and attach additional glass gems around the oval mirror. Here we painted the mini gems with Red Glitter Nail Polish. Once the glitter polish dried, we covered the back of the gems with one coat of white polish. Lastly, attached each gem with a Mini Glue Dot. It took 16 white glitter gems to “frame” in around the oval mirror. Hope this post “Inspires You to Create Something New! The creativity is endless with this mirror craft. Choose your nail polish colors, pick a different mirror size or shape, use a 5×7 vertical frame, and pick any color scrapbook paper you would like!